Looking tired and dejected, former Khmer Rouge leaders Nuon Chea and Khieu Samphan were told they would spend the rest of their lives behind bars after a UN-backed court quashed their appeals and upheld their life sentences for crimes against humanity. The Supreme Chamber Court did accept some errors were made at the initial trial, particularly regarding the killing of 250 soldiers and officials from the ousted government of Lon Nol in late 1975. But it ruled that both men were overwhelmingly responsible for atrocities committed between April 1975 and January 1979, when some two million people perished. “The supreme court chamber considers that the imposition of a life sentence for each of the accused is appropriate,” said Kong Srim of the Supreme Court Chamber. Both men appeared on the brink of a breakdown and needed court assistance into the dock where Nuon Chea wore his trademark sunglasses, to shield him from the glare of court lights, and sat in a wheelchair. Khieu Samphan shuffled in with the aid of a stick. 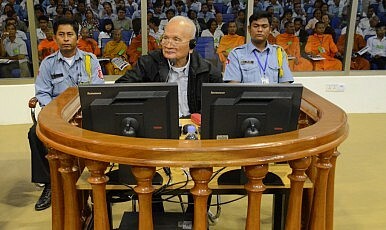 Today’s decision is just the latest in a long list of attempts to find some sort of justice for the victims, dating back to 1979 when invading Vietnamese held a People’s Revolutionary Tribunal and put the notorious Khmer Rouge leader Pol Pot and his foreign minister, Ieng Sary, in the dock for genocide. They were both found guilty and sentenced to death in absentia. However, the sentence was pardoned by King Norodom Sihanouk two decades later as part of a defection deal with the Khmer Rouge, which would secure an eventual peace. Pol Pot was placed under house arrest in 1997 and put on trial by his peers for crimes committed against the Khmer Rouge. He died the following year when the fighting finally ended. Four years later two senior Khmer Rouge generals, Sam Bith and Nuon Paet, and Colonel Chhouk Rin were convicted and jailed for ambushing a train near Kampot where 11 Cambodians were slaughtered three Western hostages taken and eventually executed. Their trial was finalized as a deal was struck by the United Nations and the Cambodian government for a joint tribunal of senior leaders – often described as those who sat on the standing and central committees responsible for the writing and deployment of Khmer Rouge policies. Surviving members included Nuon Chea, Khieu Samphan, Ieng Sary, and his wife Ieng Thirith, while the military commander Ta Mok and the head of the S-21 extermination camp Kaing Guek Eav, alias Duch, were also earmarked for prosecution. Duch has since been jailed for life while lower ranking cadres have recently been singled out for trial and Nuon Chea and Khieu Samphan are facing additional charges of genocide. However, the Iengs and Ta Mok died before justice could be rendered. Ieng Sary is the only man in history to be charged with genocide twice. Throughout the current hearings, Nuon Chea and Khieu Samphan were defiant but that had evaporated on the day, along with any last, faint hope of release. The relief among the hundreds of victims inside the public gallery and on the lawns outside the court was palpable. To date the tribunal has cost about $267 million which is about $150 for each Cambodian who died under the Khmer Rouge, or the equivalent to the cost, according to one estimate, of one bridge across the Mekong River.